Venique is a favorite polish of mine. I recently purchased their new collection Venique Goes Hollywood and I love these foil polishes. I used two of the shades for this checkerboard mani. These polishes worked superb for this as one coat worked nicely. Reels of Fun is the silver foil and Acting is Living is the purple foil. I will share the others with you soon. I used scotch tape to make this design. It's always a fun nail art method. How would you use these foil polishes? Venique polishes can be purchased at CosmoProf or fine salons. I'm going to the Rockies game tomorrow. I love the Rockies - although they really aren't showing up to the games this year. I hope they do better tomorrow. Either way - I am not a fair weather fan. I am a fan no matter what. 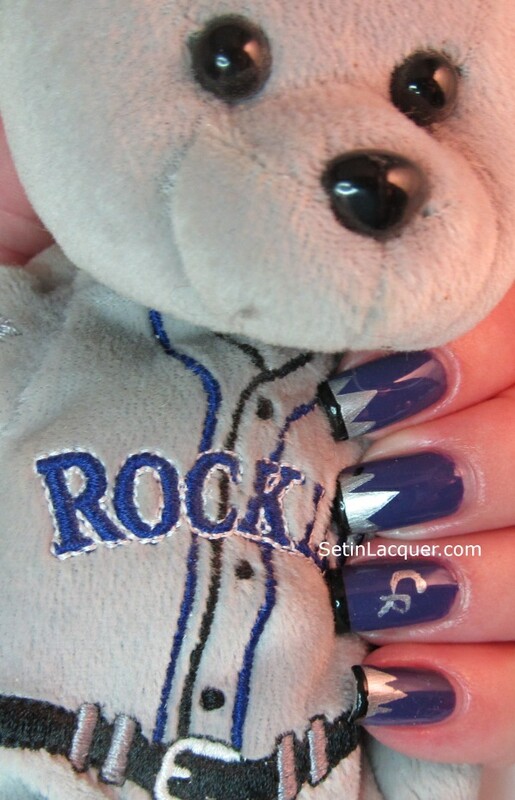 So to show my team spirit I did a Colorado Rockies mani for the weekend festivities! I used Orly Charged Up for the base and Hits Hematita for the silver. 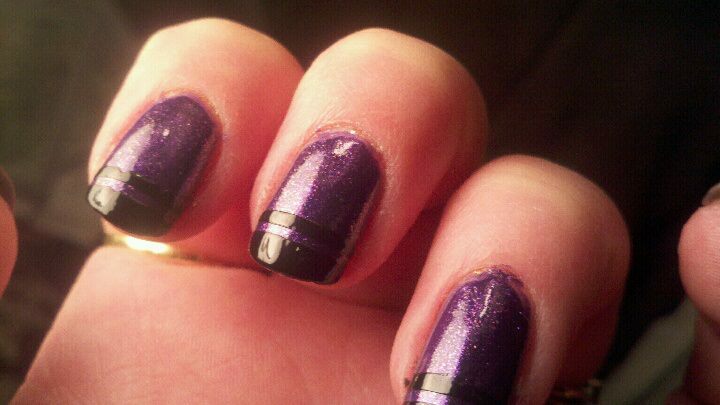 The black tips are Zoya Raven. I applied a base coat and then two coats of Orly Charged up and then a coat of Seche Vite fast dry top coat. Then the time consuming part... cutting the scotch tape into the mountain shapes. That was a killer. Between going cross-eyed from trying to focus on the tiny cuts and my hands shaking trying to cut those small shapes it was an effort. But it worked out. What didn't work out was the hand drawn CR. I guess it is okay. But it isn't very "finished." But I am sure during my yelling, screaming and jumping up and down during the game no one is going to get that close. I put the cut out scotch tape on my nails and then painted on Hits Hematita and removed the tape immediately. Then after a coat of Seche Vite fast dry top coat I applied a piece of scotch tape (make sure to put it on the back of your hand a couple of times to get most of the "sticky" off.) 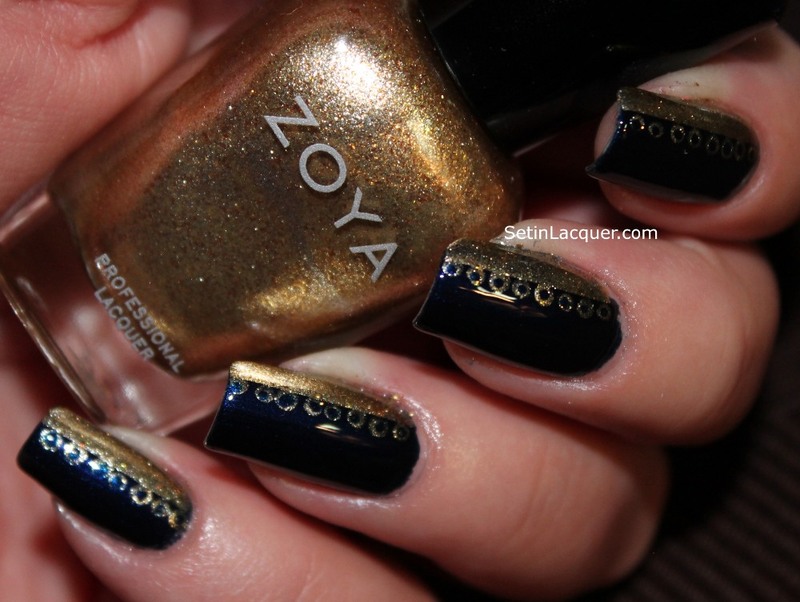 for the tips and then used Zoya Raven. Again, I immediately removed the tape. Then another coat of SV and I was done. It may sound quick but I am telling you... Cutting that tape was an effort in futility. I haven't sported a scotch tape mani in a while so I was looking forward to doing something special. Well, after what seemed like hours pulling one polish out just to look at it and put it back again I finally decided on Essie "Smooth Sailing" and Deborah Lippmann "Dancing in the Sheets." These colors are both stunning and would be delightful on their own. I applied Essie "Smooth Sailing" as a base color. Let me tell you. . . I was tempted to stop with just the base coat. Smooth Sailing is completely mesmerizing on its own. Then I applied a coat of Seche Vite Fast Dry top coat to protect my polish from the tape. And of course to make it dry faster. Then I used scotch tape to mark off the first checkerboard square. Don't laugh at my tape. It was on clearance and I think I like it better than clear tape. It makes it much easier for me to see where my tape line is. If you try the scotch tape method don't forget to put the tape on the back of your hand or wrist and remove it a couple of times to get a lot of the adhesive off of the tape. Then I applied a coat of Dancing in the sheets on the area I had taped off and as soon as I was finished painting the polish on I pulled the tape off. I did this on each nail and then applied another coat of Seche Vite. I taped off the other checkerboard and repeated the steps. One thing that makes it easier is to stop the tape at your cuticle line. This keeps the tape flat on your nail and makes the line cleaner. I finished off with yet another coat of Seche Vite (I really need to buy stock) and I was finished. . . 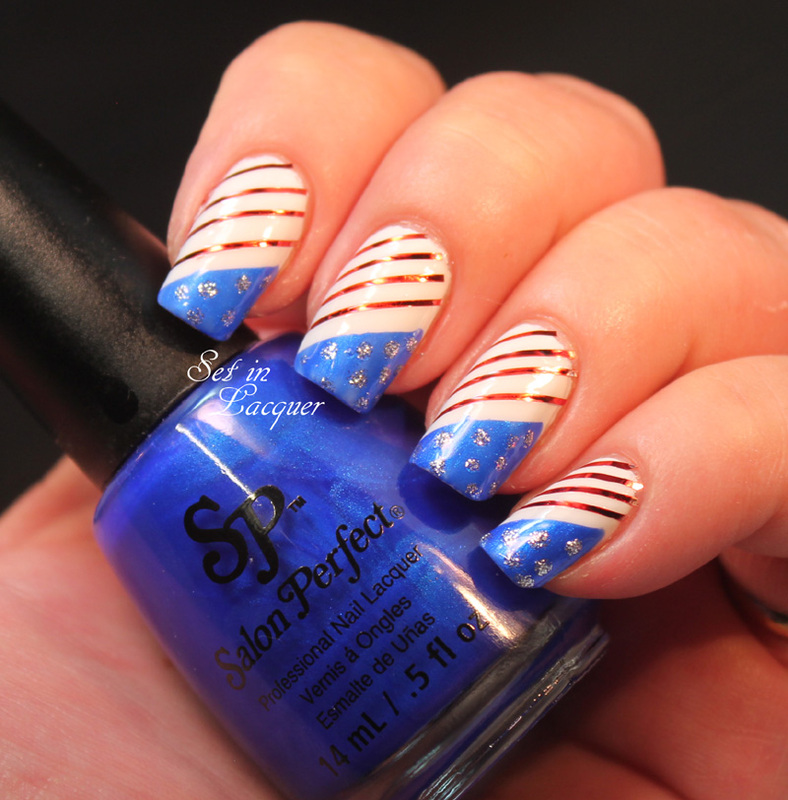 Instant nail art! 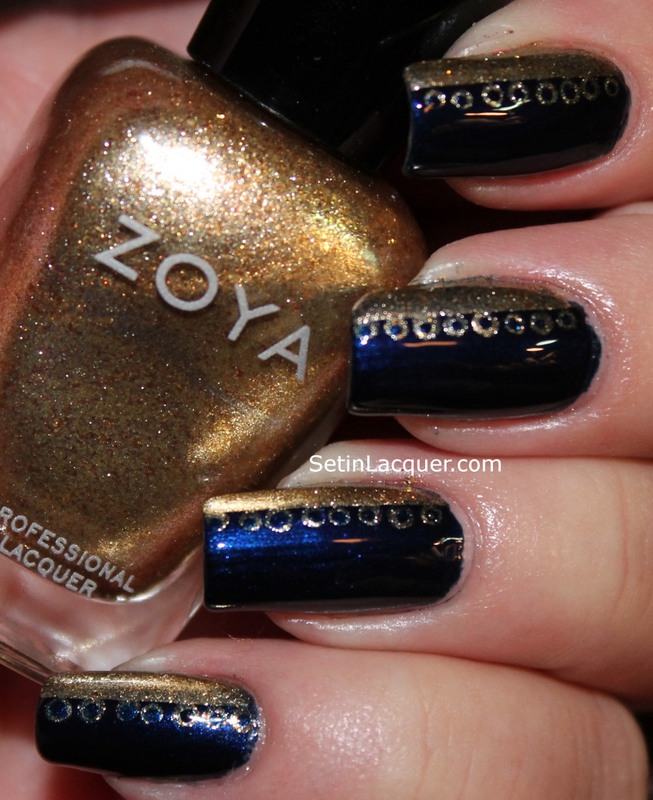 For this manicure I used two coats of Zoya Skylar for the base color. I love this color. A very subtle blue with lots of shimmer to it. The color reminds me of my favorite pair of faded jeans. As usual Zoya didn't disappoint me. The application was flawless and the brush is wider that a couple of my other Zoyas. The dry time was relatively fast. Before I used the scotch tape I applied a coat of Seche Vite fast dry top coat. I have found that using SV is a must when I do scotch tape manis. Otherwise I would be waiting forever to finish. I got most of the sticky off the tape by sticking the tape to the back of my hand. This way it is sticky but not sticky enough that I will remove my polish with it. 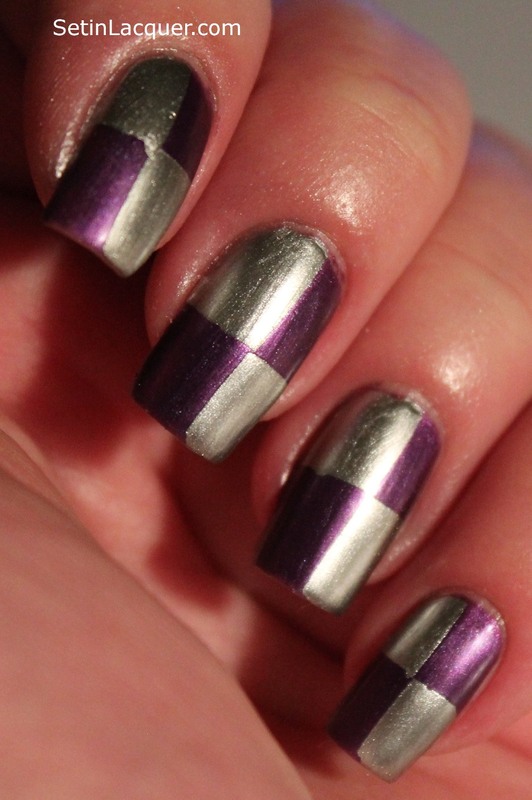 Then I applied the tape in a diagonal line over my nails leaving the tip of my nail showing. I quickly applied a thick coat of Loreal Whimsical and removed the tape without waiting. 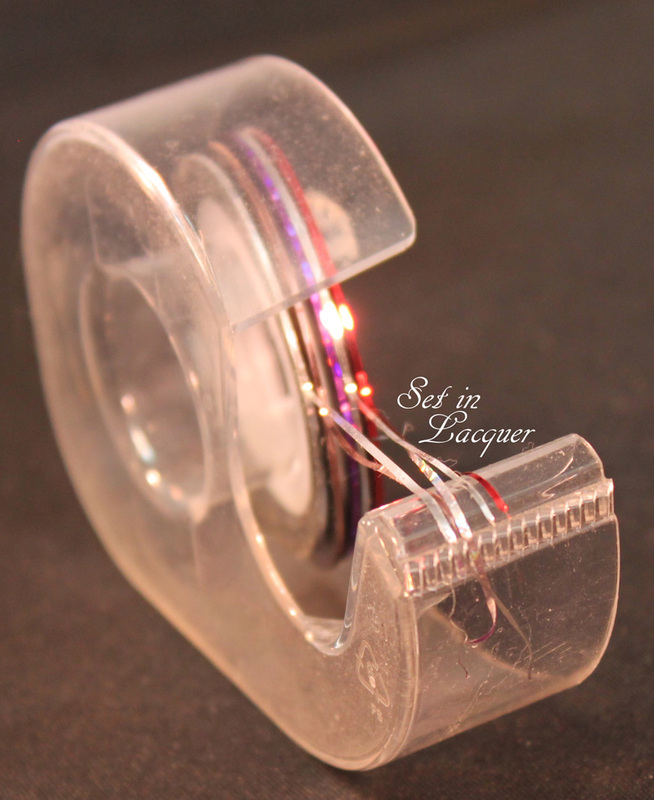 If you wait to long the tape will begin to dry and will pull up at the edge of the tape. I was happy with the combo but of course I had to add one more thing. I used a striping brush and added a stripe of Zoya Ibiza. I like the look - not too flashy - but very clean and classy. Tonight I have a new mani for you. I wasn't going to do my nails today because I had a killer headache. Then a Tylenol miracle happened and the headache was gone. What was the first thing I wanted to do? You got it.. Paint my nails. I started out with a base coat of Seche Vite and then applied two layers of OPI's "Manicurist of Seville." I am in awe of this color. It's a deep, rich color of red (almost a burgundy) with wonderful coverage and super shine. Then I used scotch tape and applied Sinful Colors "Black on Black." 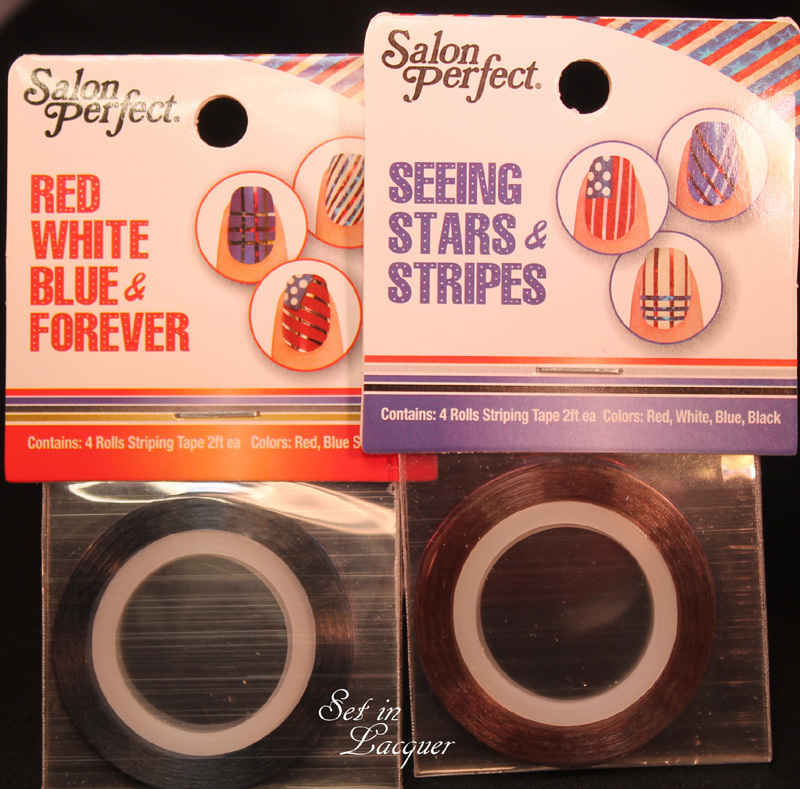 See my post here about using scotch tape to create a unique manicure. Then to top off the the diagonal and add a little extra "zing" I used a dotting tool and added accent dots of OPI's "Pros & Bronze." If you don't have a dotting tool that's okay. See my post here about making your own. I love the look. How do you accent your nails? I seriously think it takes me longer to pick out a polish to wear than to paint my nails. So I used several for my NOTD. I used OPI "I have a herring problem" for the base. I love this polish. It is from the new Holland Collection. For the diagonal tip I used FingerPaints "Art of theft." And for the dots I used Nicole OPI "Make a comet-ment". This is one of my favorites. It has serious glitz and doesn't have a gritty finish. It almost looks like a rhinestone.